Task View has received some big improvements in the Windows 10 Anniversary Update. With the Windows 10 Anniversary Update, Microsoft has introduced a couple of new improvements around the Task View feature, which gives users an overview of all their open apps as well as access to virtual desktops. In the past, Task View was pretty basic, but with the Anniversary Update, Microsoft has added a few additional options that make using it far more productive. Both functions do pretty much the same thing, except the latter makes it so if an app has multiple windows open, all those windows will be pinned rather than just the one. 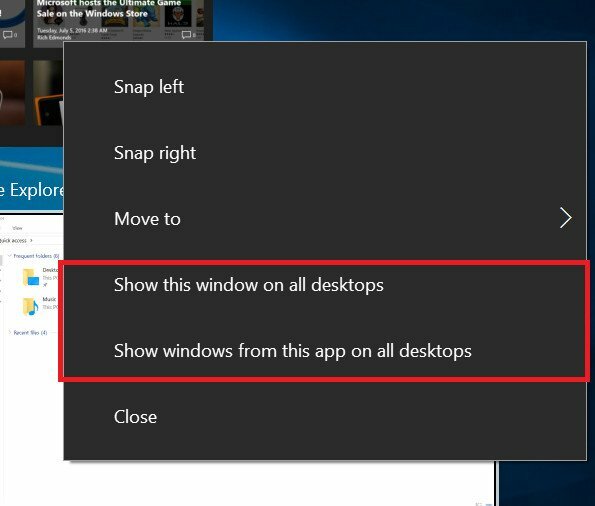 There's also additional support for multiple-monitor users too, with the option of pinning an app to any particular monitor regardless of the virtual desktop. Microsoft has also added a new touchpad gesture for Task View too, making it super easy to switch between Virtual Desktops without needing to open Task View first. With 3 fingers on a precision touchpad, swipe left and right when multiple desktops are open and you'll find you can switch between all your open desktops with ease. Stay tuned at Windows Central for more tips, tricks, how-to's and walkthroughs on the lead up to the launch of the Anniversary Update on August 2nd for Windows 10 PCs, tablets, mobile, and Xbox One.